Check out our 2017 Origin Report on Kenya here. Coffee is sold by way of two main marketing systems in Kenya: by auction at the Nairobi Coffee Exchange, or through direct sales, often called “Second Window.” Since the establishment of the auction system in the 1930s, the majority of Kenyan coffee has been traded that way. It’s evolved from traditional “open-outcry” bidding on the market floor to a largely silent system, with an electric trigger for each trader to hit during bidding. Through this system, prices of highly sought-after coffees can soar, as agents work to outbid each other on the coffees that are available each week. The auction system works like this: Each estate or co-operative society works with a marketing agent, whose responsibility it is to bring the coffees to auction to sell to the highest bidder. The marketing agent will charge somewhere between 1.5–3% of the price of the coffee, and there is also a government tax imposed on the sale of coffee. Marketing agents tender samples of the milled coffees to interested bidders, and auctions take place on Tuesdays throughout the year in Nairobi; the coffees that are due to be auctioned any given week are printed in a catalogue available through the Exchange. Many exporters will bid on lots at auction and sell them privately to importers and roasters. The introduction of the “Second Window” created an avenue in which a farmer and buyer (such as a roaster or importer) can negotiate a price somewhat separate to the bidding at auction, typically by discussing and agreeing upon the deal before or during the harvest. Some exporters will also cup and directly purchase coffees from their associated marketing agents or mills, negotiating a price based on the previous week’s auction prices for specific grades (AA, AB, PB, and so on). The first thing that comes to mind when one thinks about Kenyan coffee is “acidity,” but what we are looking for is not simply mouth-puckering brightness or one-note citric acid. Generally, we seek out complex, refined cups that show black currant, grapefruit or kaffir lime, mouthwatering notes of tomato or tamarind, and sparkling tropical fruit like pineapple. The famous SL varieties—SL-28 and SL-34—tend to be juicy and dynamic, while French Mission is typically a more creamy and citric cup. In addition to variety differences, regional variations exist as with most large coffee-growing countries. Nyeri’s coffees tend to have more fructose sugar, juicy mouthfeel, and strong tart acids. Embu’s profile is more complex, with generally the darker forest fruit, more browned sugars, and overall a bit more balance. Kirinyaga shows the more floral and delicate cups, generally a more refined quality and complexity. A note about Kenyan “classic” varieties: The “SL” in SL-28 and SL-34 stands for Scot Laboratories, which was hired in the 1930s to undertake a series of selections and tests on Kenyan coffee varieties in order to determine which had the greatest potential for success, both in terms of quality and cultivation. Scientists identified more than 40 trees of different types, giving them a number with “SL” for classification—these varieties are considered selections, not, strictly speaking “hybrids,” though many of them were the genetic offspring of cross-pollinated types and spliced cultivars. A more modern variety and a direct result of hybridization is Ruiru 11, which is a combination of Timor Hybrid variety (an interspecific hybrid of Arabica and Robusta) and Rume Sudan, a cultivar that is resistant to coffee-berry disease, which is a common plight in the country. Ruiru 11 has been available for sale since 1986. 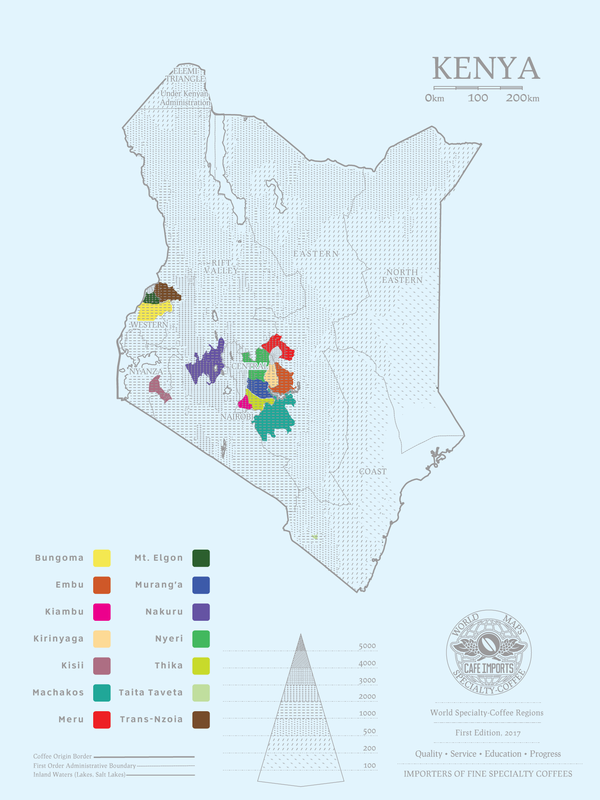 Aside from the varieties grown in the country, and the altitudes that range from 1,400 to more than 2,000 meters above sea level, the special processing that most Kenyan coffees undergoes is part of what contributes to its particular flavor profile. Here’s a general breakdown of how processing happens in Kenya (though, truthfully, there is no one “standard” for how a factory or washing station handles its coffee): Farmers will bring their cherry to the factory, where it is weighed and put into the hopper with the rest of that day’s collection. (The farmer is given a receipt for the value of the coffee.) The coffee is depulped using one of two types of equipment: A single-disc depulper, which directs all of the coffee into a single fermentation tank, or a pre-grader/multi-disc depulper, which uses multiple water tanks to pre-sort the coffees by density before and after the depulping, which allows the smaller grades to be depulped again as needed. The single-disc depulping is more common at estates than at the factories. Factories will ferment every grade of parchment coffee dry in its mucilage for 24–48 hours, then move the coffee through water channels to separate washing tanks, where the softened mucilage is sloughed off. Premium AA lots are sometimes sent to holding takes to be submerged underwater for an additional 24 hours. The tanks are drained, and the coffee is given a quick “pre-dry,” or “skin dry,” laid out in full sunlight in thin layers on raised beds for about six hours; this is to prevent the parchment from cracking. The beans are then moved to raised beds where they are spread in thicker layers, and allowed to dry for 7–10 days. The coffee is typically dried to 11–12% moisture. More than a decade ago, when Cafe Imports began direct sourcing coffees from Kenya, most importers were not willing to take the chance on bringing in small, traceable lots of coffee from individual mills and estates, and the word “microlot” was not yet in common usage in specialty coffee. Jason Long, one of Cafe Imports’ principal partners and coffee buyers, decided that the risk was worth the potential reward: The result is that we are able to offer not only exceptional high-end Kenyan coffee in traceable chops, often from the same factories and estates, but also offer a selection of solid full-container lots of solid quality mid-price coffees (including our signature Kichwa Tembo and Regional Select Uteuzi Jimbo projects) that are suitable for blending as well as lower-cost single-origin options. Our ability to purchase coffees based on cup quality not only at auction and through exporters but also thanks to our “Second Window” relationships gives us the ability to provide our customers with a wider range of Kenyan offerings at different price points and profiles.